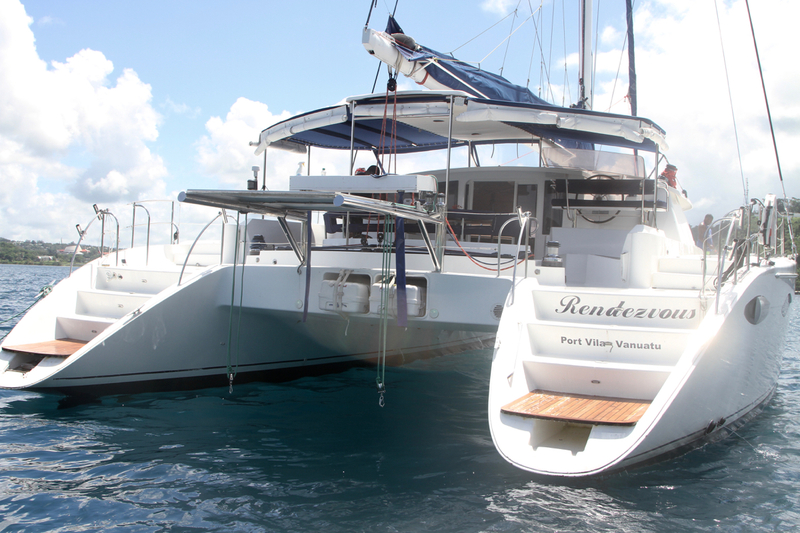 ‘Rendezvous’ is a beautifully presented example of this highly enviable and highly sought-after example of one of Fountaine Pajot’s flagship Grands Yachts luxury catamaran. Designed to cater to the highest end of the sailing market, this jaw-dropping yacht is the creation of the joint minds of the most awarded yacht designers in the world. 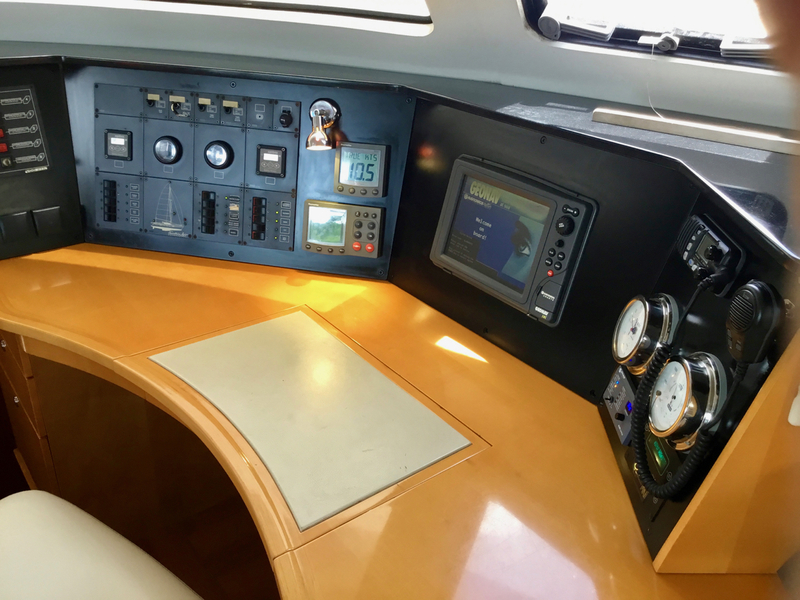 From drawing board to finish, nothing but the best material, technology and workmanship came together to create a yacht that is remarkable in every aspect. 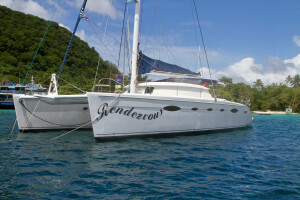 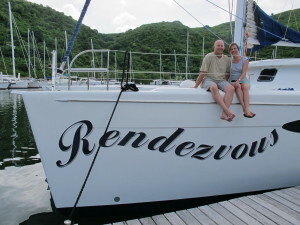 ‘Rendezvous’ has only had two owners. 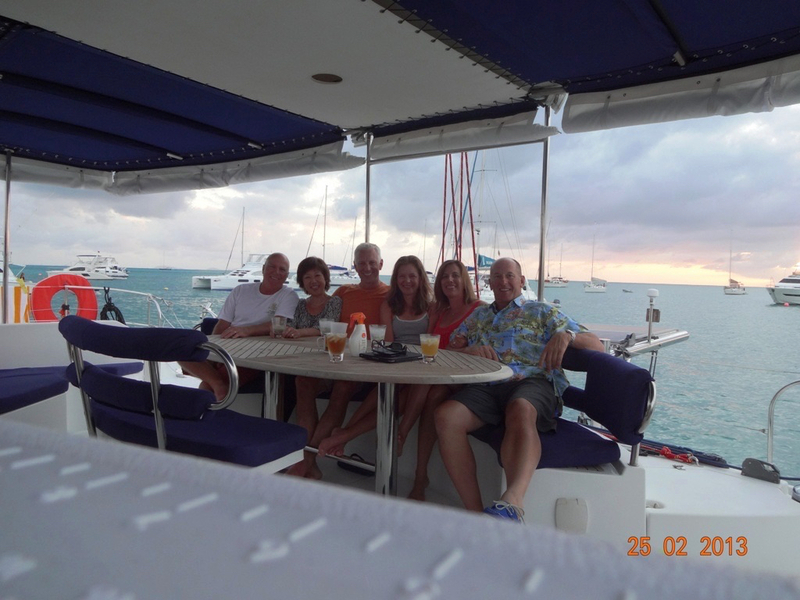 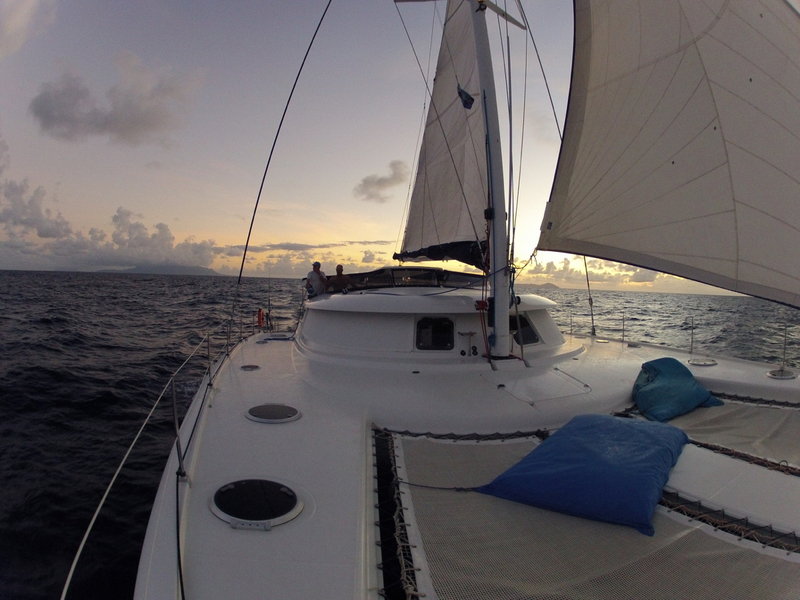 The first owner, who also owned a Fountaine Pajot Tahiti 80’, ran a small but very exclusive fully-crewed charter operation in the Caribbean. 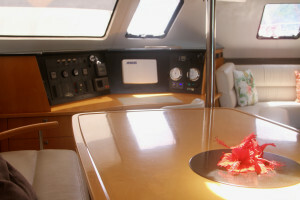 The Tahiti 80’ being the main course, and the smaller Eleutherea 60 was used a handful of times but regularly catering to VIPs such as Mariah Carey or Julian Lennon. 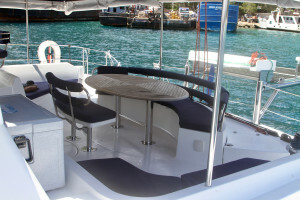 The boat was attended to by a full professional crew at all times and was never bare-boat chartered. 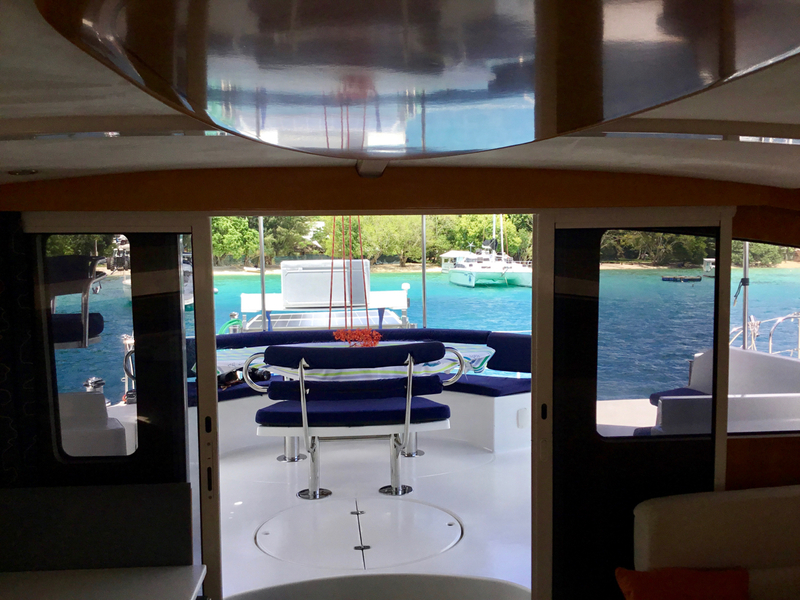 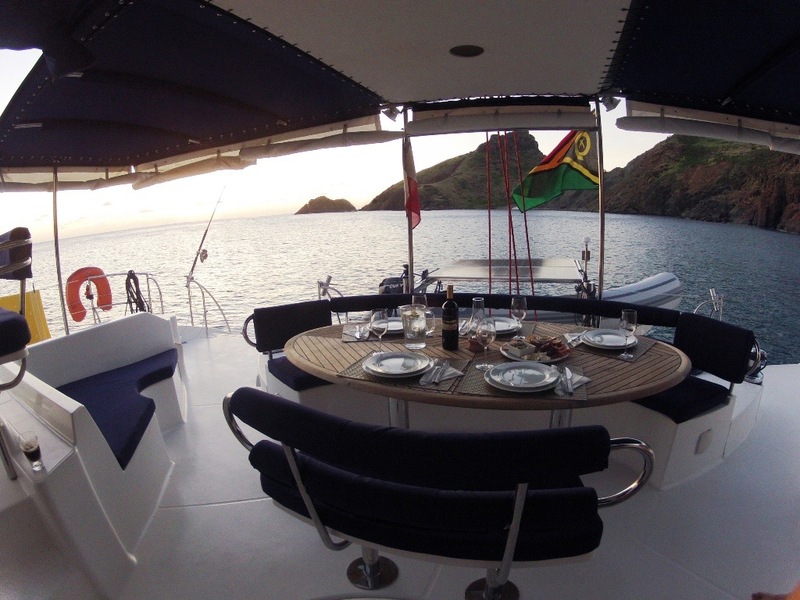 In 2012, the current owner purchased the Eleuthera 60, then named ‘Scoobyfree’, renamed it ‘Rendezvous’, and proceeded to an extensive upgrade and refit of the yacht (see details below), keeping the yacht in the Caribbean to enjoy with his family on holidays. 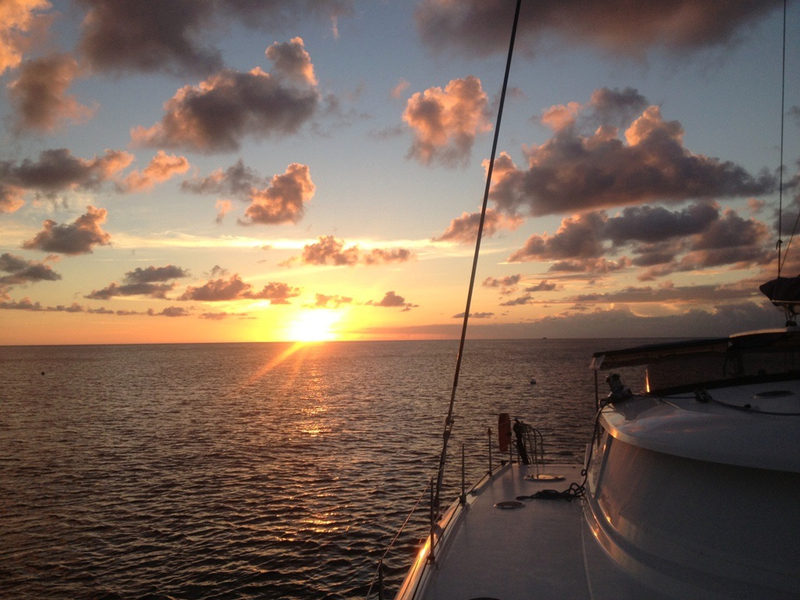 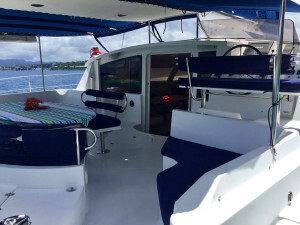 In Mach 2013, the yacht left the Caribbean to begin a journey across the Pacific with a professional crew to be delivered to her new home in Vanuatu, where her Australian owners, in love with this beautiful and pristine sailing grounds decided to keep the yacht under management with the highly reputable Vanuatu Yacht Services and SEAL Superyachts, whose staff ensure that the yacht is kept in immaculate condition at all time. 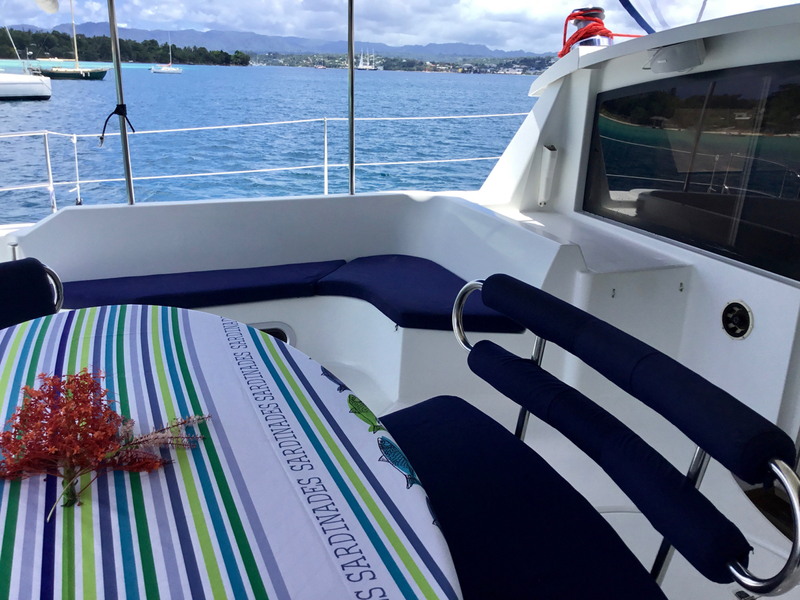 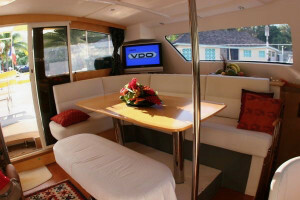 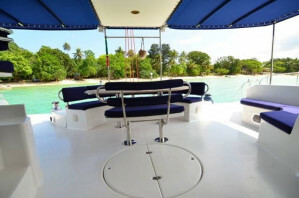 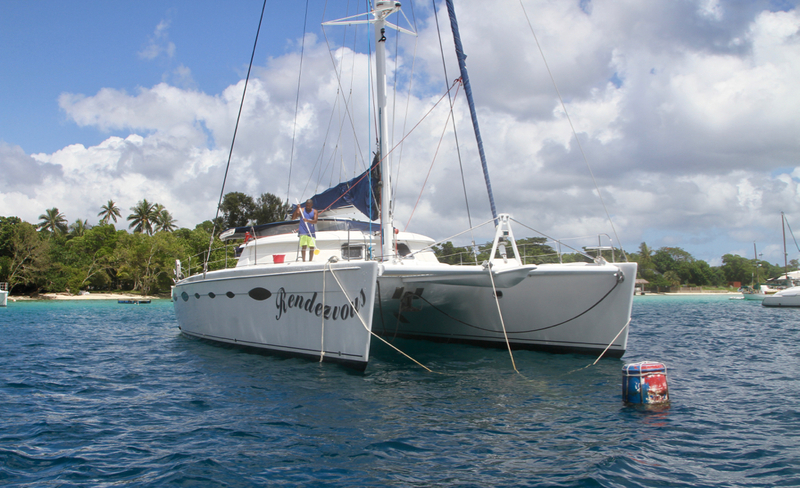 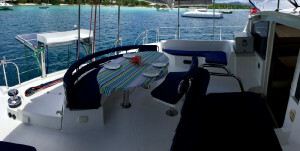 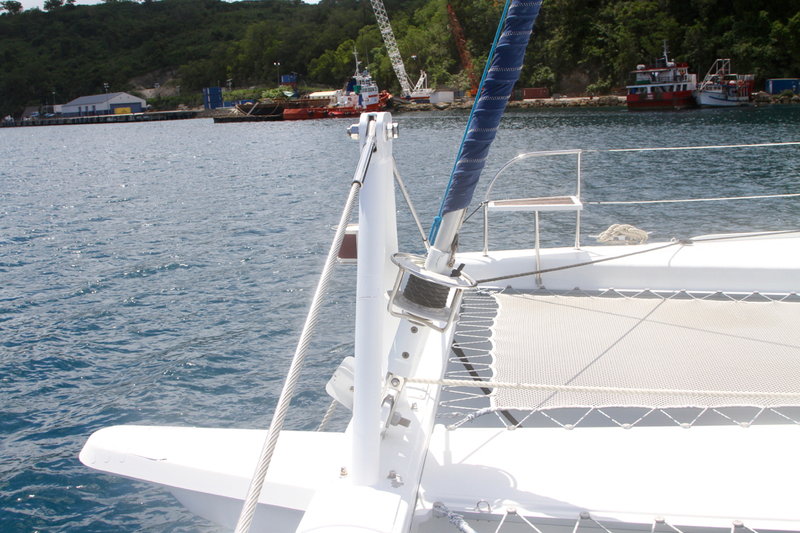 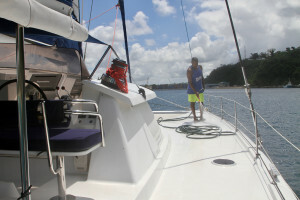 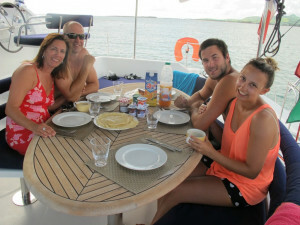 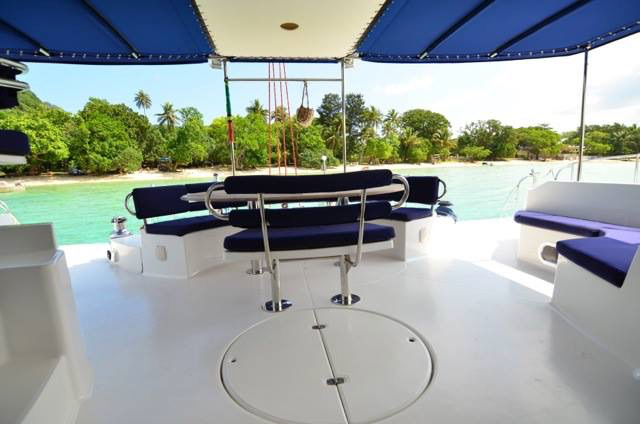 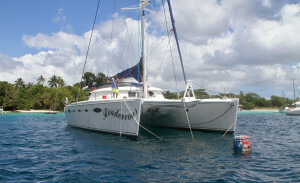 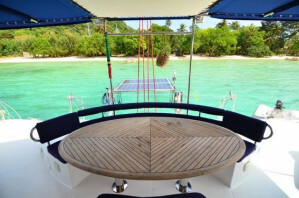 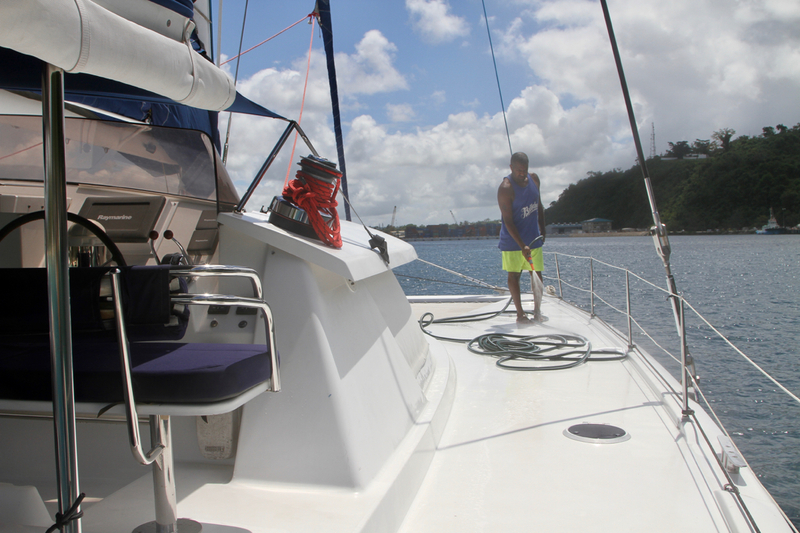 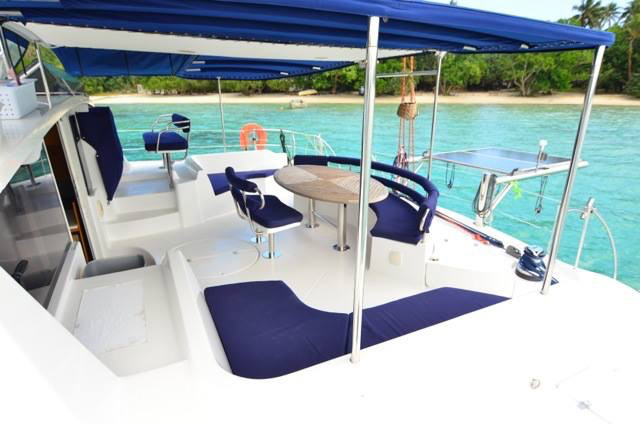 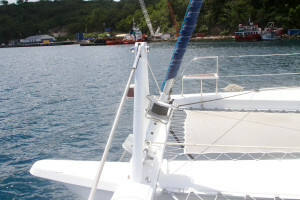 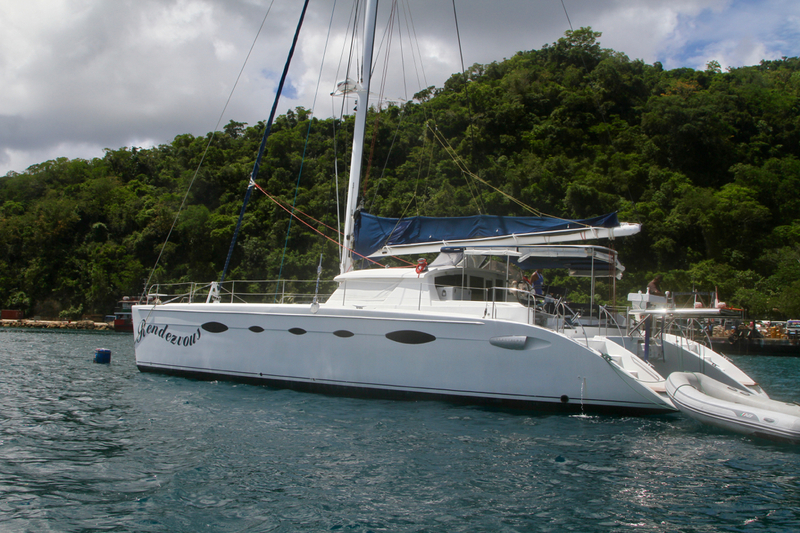 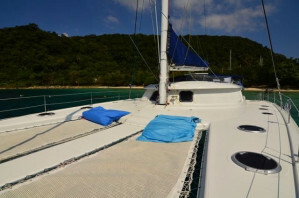 Once in Vanuatu, the yacht was registered as a company and is currently occasionally used as a luxury skippered charter. This could be very interesting to a new owner wishing to purchase a yacht that is already established as skippered charter, with all the relevant permits and registration, and managed by a reputable company. 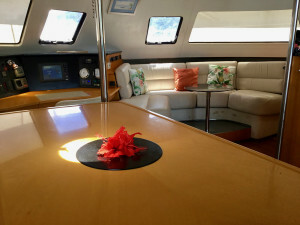 The yacht is only used a few times a year for skippered charter, as the owner prefers to keep the yacht for his private use, never accepting more than 4-5 bookings per year, which already provides a more than adequate income to cover for the yacht’s maintenance costs and much more. Demand is very high though, and a new owner may wish to accept far more requests for bookings, hence effectively purchasing a yacht in a mostly untouched, pristine paradise very fast becoming one of the most sought after holiday destination in the world, especially for luxury skippered charters, thanks to the hard work or companies such as SEAL Superyachts and Vanuatu Yacht Services, who are already managing the boat. 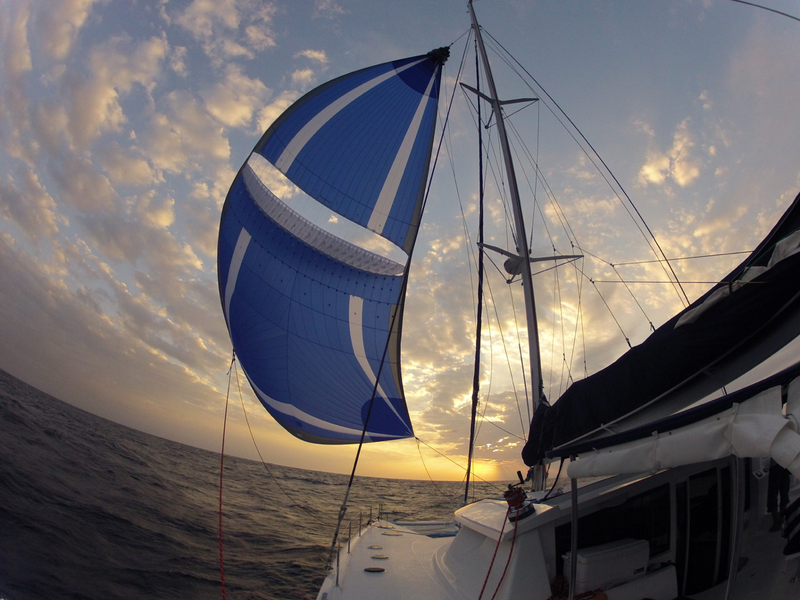 WATCH VIDEO FEATURE, PUT TOGETHER DURING OUR LAST CRUISE FEBRUARY 18. 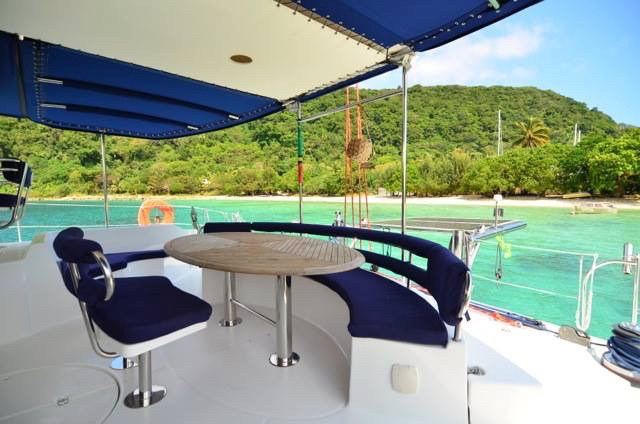 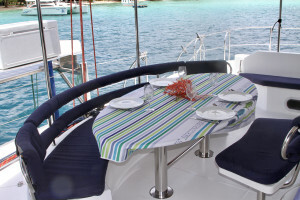 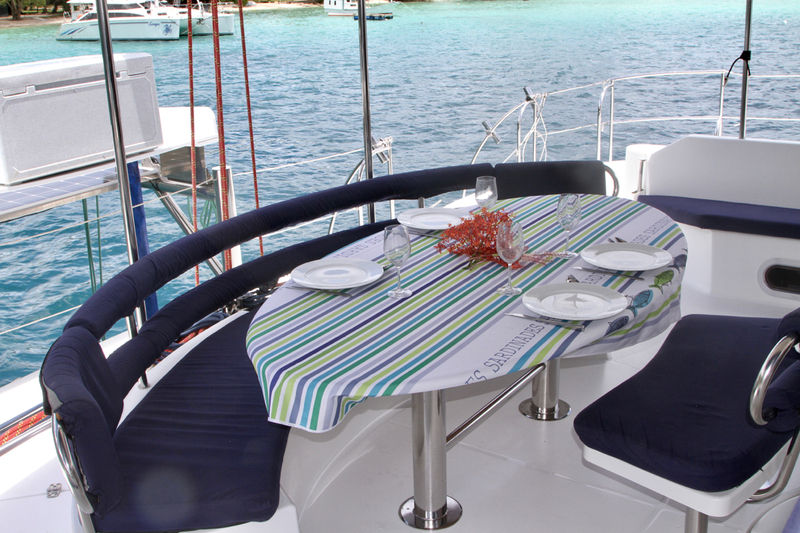 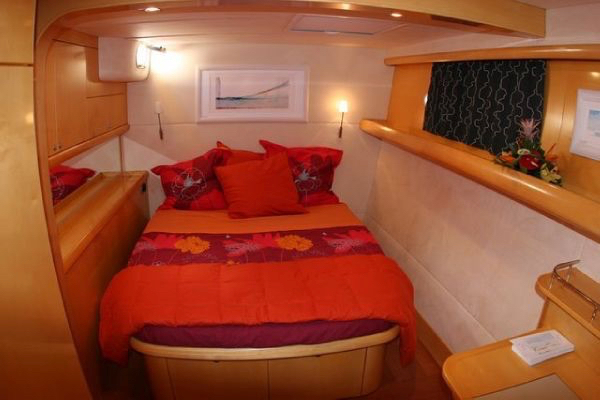 Rightly described as ‘Big, Bold and Beautiful’, the Eleuthera 60 is a sight to behold. 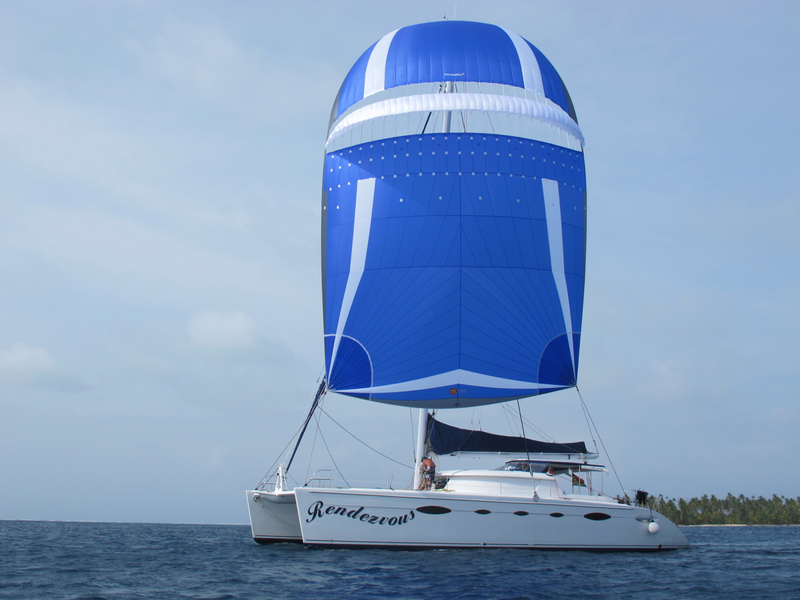 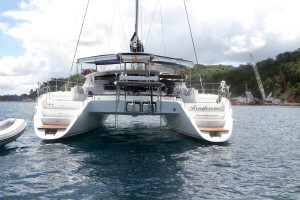 Her refined lined are perfectly proportionate, unlike what most people imagining such a large catamaran would expect; in fact, the very opposite of bulky, top heavy, or squat. 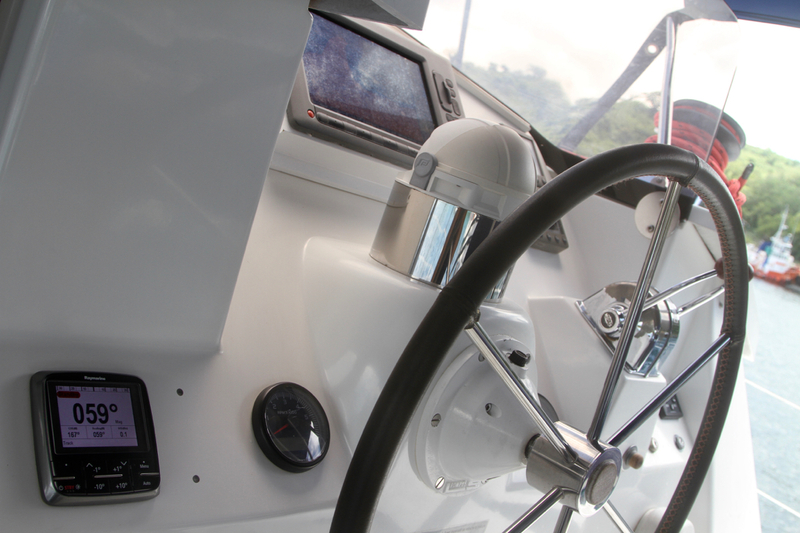 Her hulls have just the right shape to emphasise power but remain elegant. 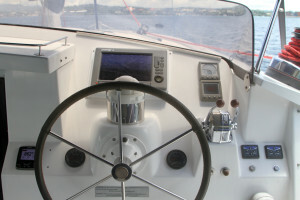 Her transoms, albeit large enough for several people to sit on the steps side by side, are tapered to a fine scallop shape, with good elevation of the cockpit above the water to further define the powerful transom lines. 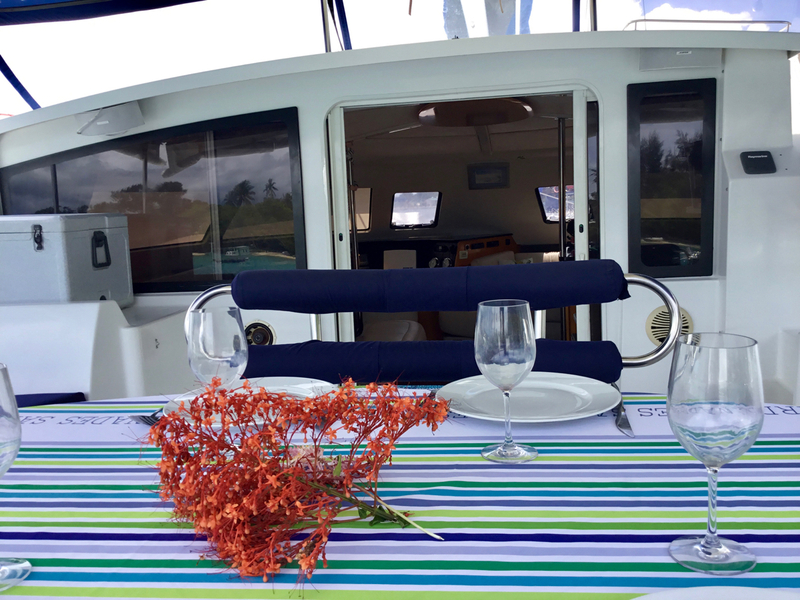 Seen from the outside, the Eleuthera 60 presents as an eye-turner for all the good reasons, luxurious but not ostentatious, powerful without being bulky, racy and elegant in spite of her sheer size. 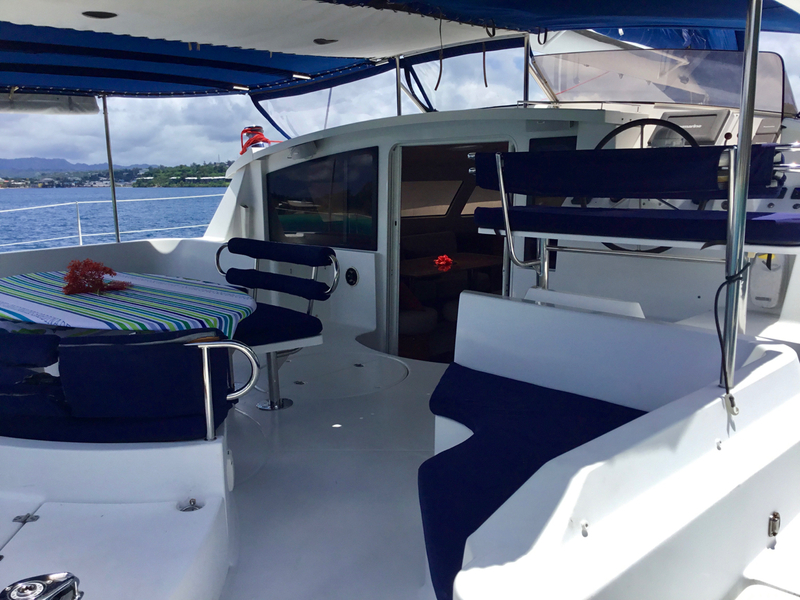 Strength-wise, the Eleuthera 60 is a sensible choice for someone envisaging serious blue-water cruising. 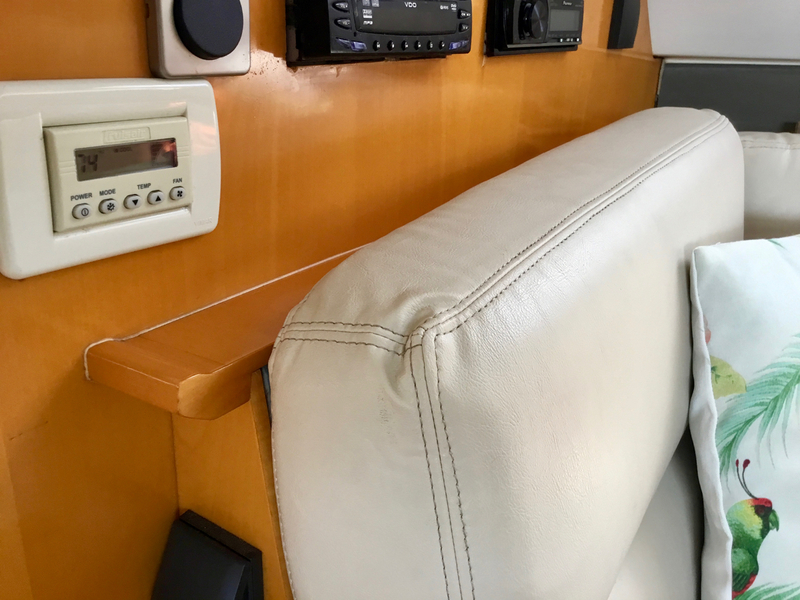 Capable of reaching 14-15 knots effortlessly, the hulls have been spared no effort in ensuring that the strength of the boat matches the performance. 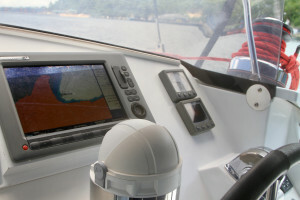 To ensure ultimate and long-lasting integrity adequate to her staggering dimensions, both hulls and the bridgdeck are built as one piece, using isophtalic and orthophtalic resins and multidirectional cloth, with vacuum bag and resin infusion building process which employs a closed mould and the use of atmospheric pressure to draw resin through the laminate. 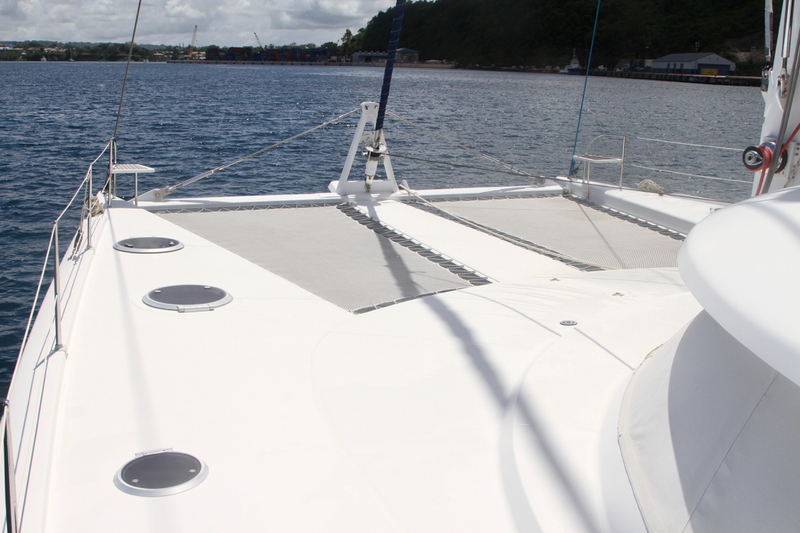 This method ensures a lighter weight but stiff structure. Once on board, jaws drop further, and for good reasons. 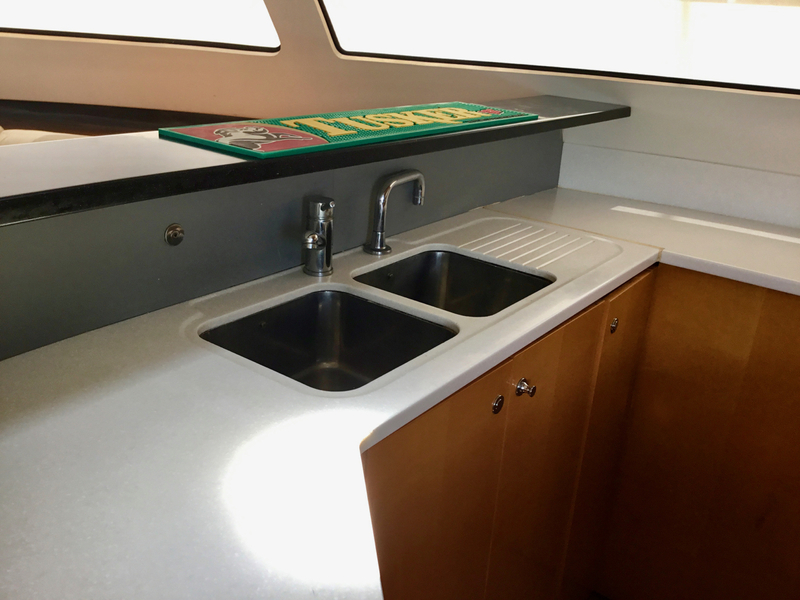 Nothing about the Eleuthera 60 was meant as a cost-saving, quick production line, or to cater for the more accessible market. 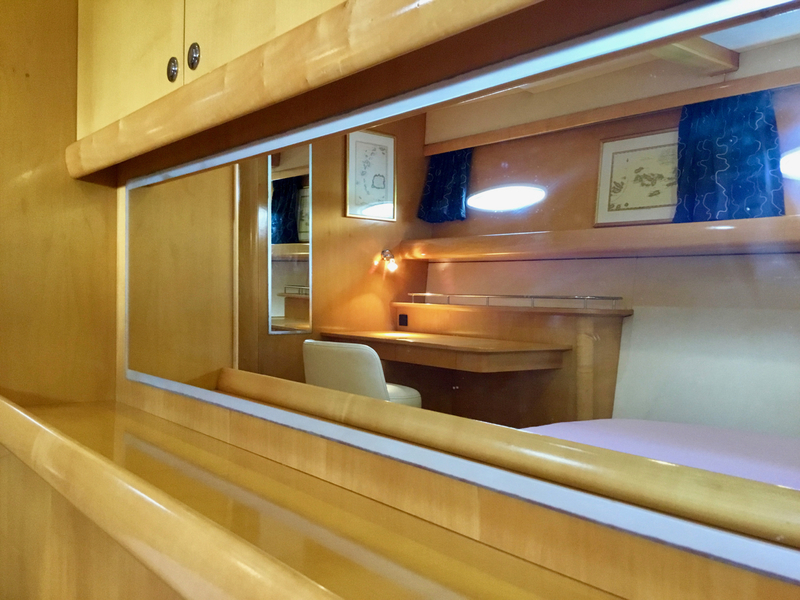 The Eulethera 60, like her other Grands Yachts Fontaine Pajot sisters, have been lavished to cater for the high end, and nothing but the very best materials, fabric, timbers, hardware and appliances were chosen in the fit-out. Designed to optimise indoor-outdoor living, the yacht’s living area is on one level plan, with an incredibly well thought-of layout which offers several meeting areas, from the more intimate, cosy lounge area with coffee table, to the magnificent salon, two L-shape settees for relaxing in the cockpit, and of course the large teak-covered cockpit table. 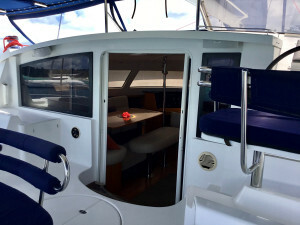 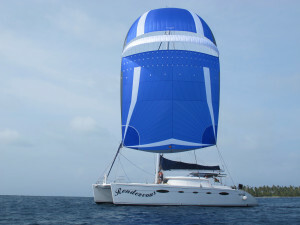 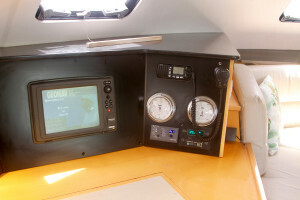 The cockpit accommodates ample storage areas for all your equipment and water toys, and can be partially shaded in a multiple of ways thanks to the awning/hardtop and modular sun-shades. 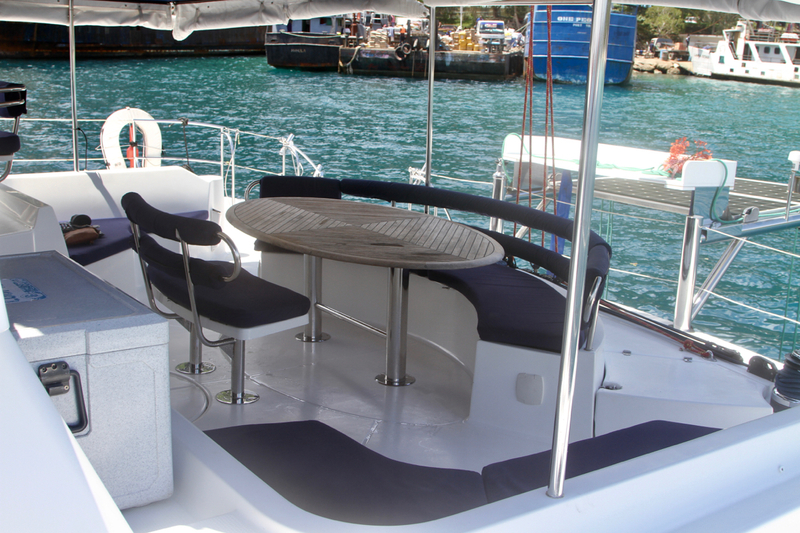 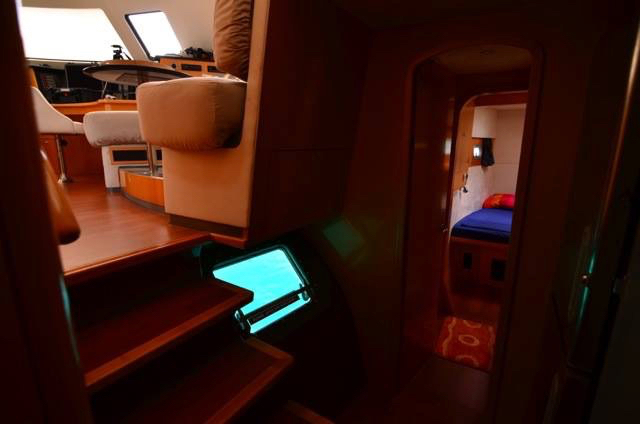 A step up to the deck takes you past the two engine room hatches, which not only give you a comfortable to the engines for maintenance, but also plenty of room for the generator, heavy electrical and hydraulic controls etc. 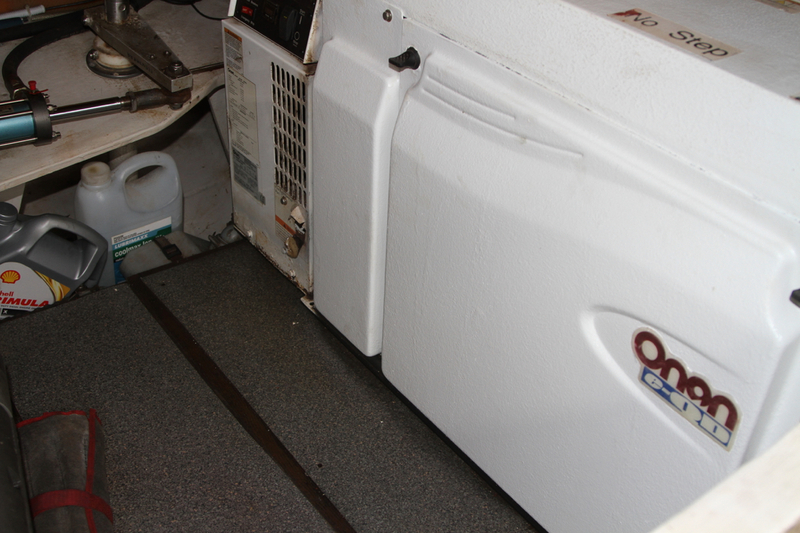 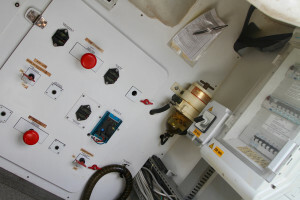 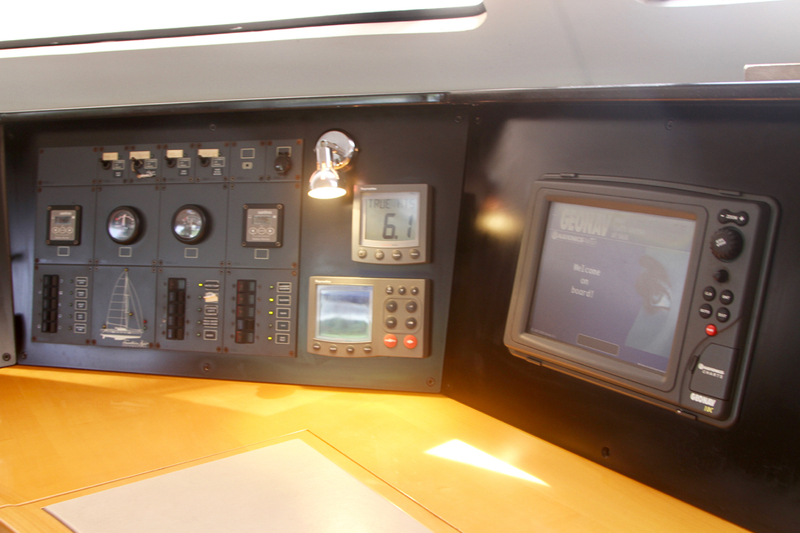 Both engine rooms are kept clean, and the engines/generator serviced religiously. 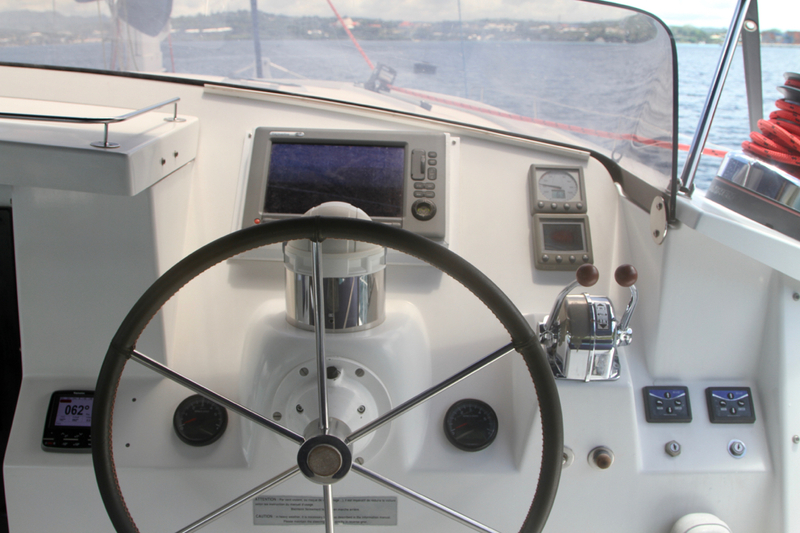 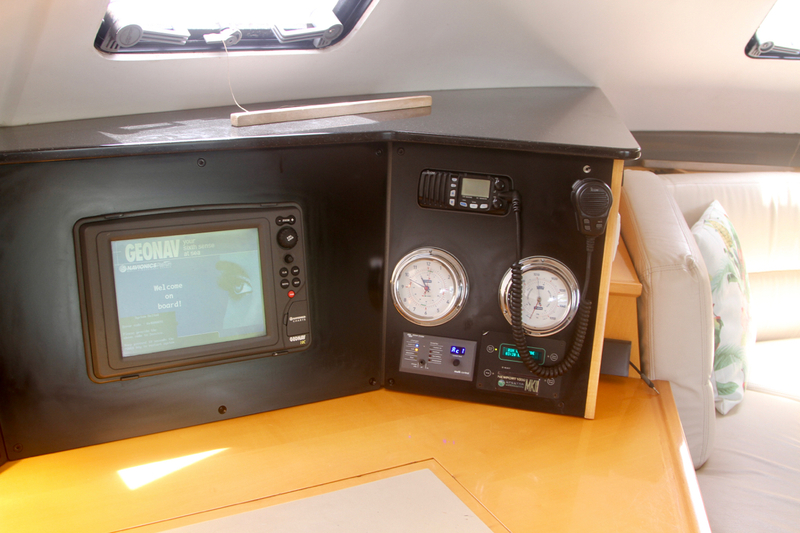 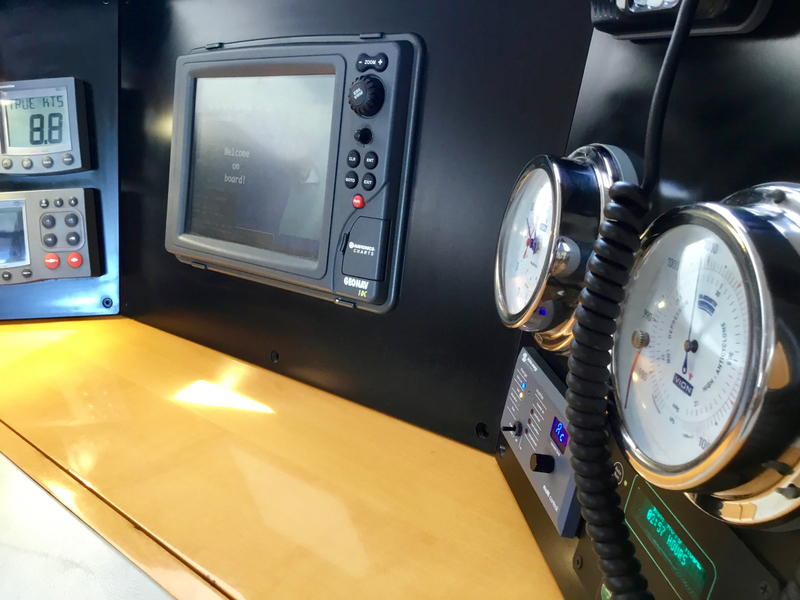 The steering station offers the advantages of being well protected from the elements and full 360 visibility, access to all the sheets and running rigging, instruments etc. 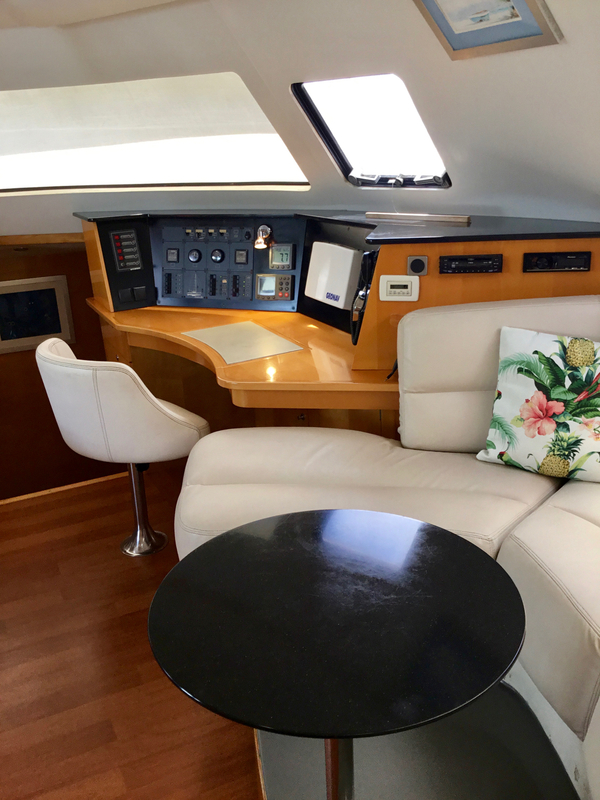 but is also designed with the sociability and comfort of the owner / skipper in mind, who can be closer to his guests and family rather than isolated on a flybridge-type design, yet slightly raised for a privileged position to the controls, deck hardware, instruments etc. ‘Rendezvous’ is a Orchestra’ design, with four cabins and four bathrooms, yet with a proper Master cabin too, which is much larger than the other cabins and has a lovely little study area. 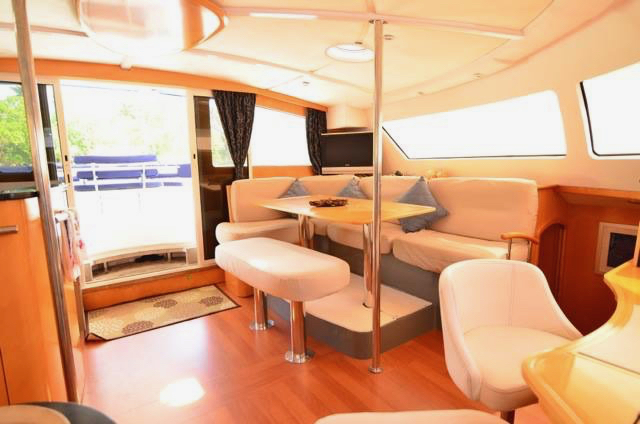 This award-winning layout is very popular, as it enables the owners to accommodate 6 other guests without losing the well-deserved larger footprint and comfort of a proper Master cabin. 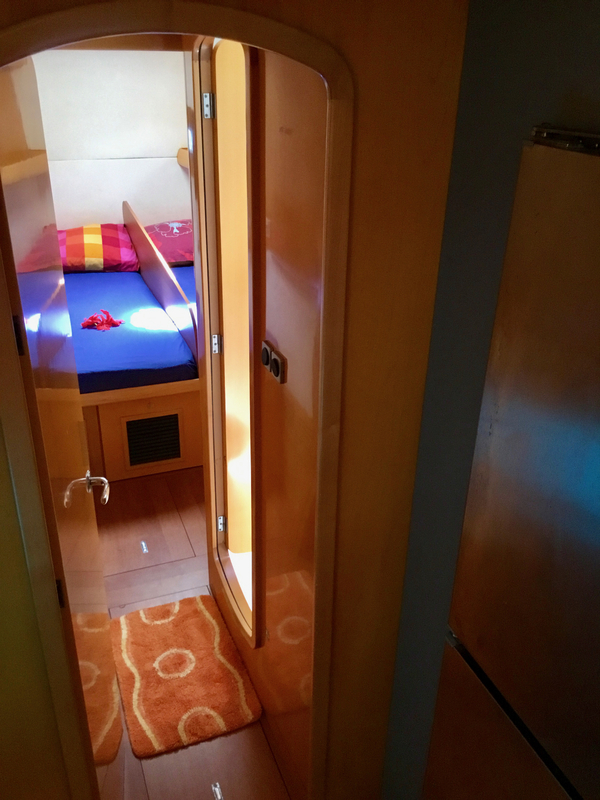 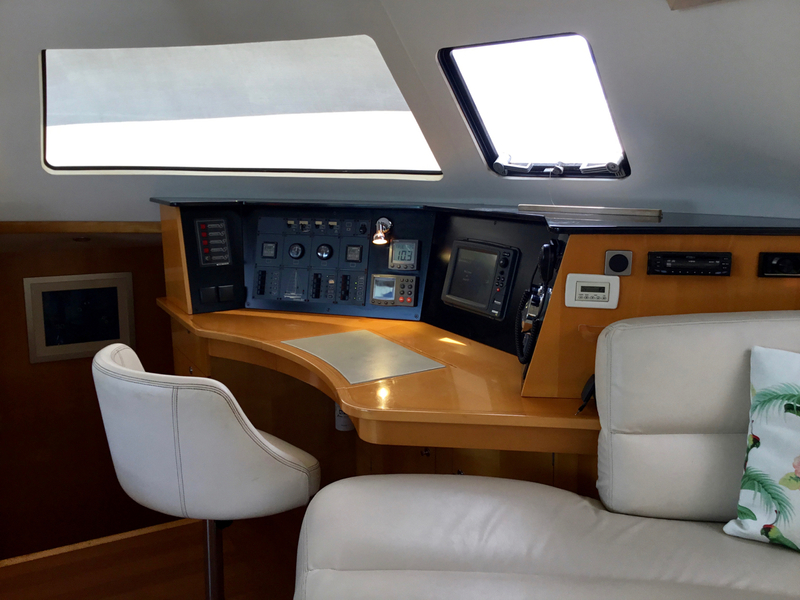 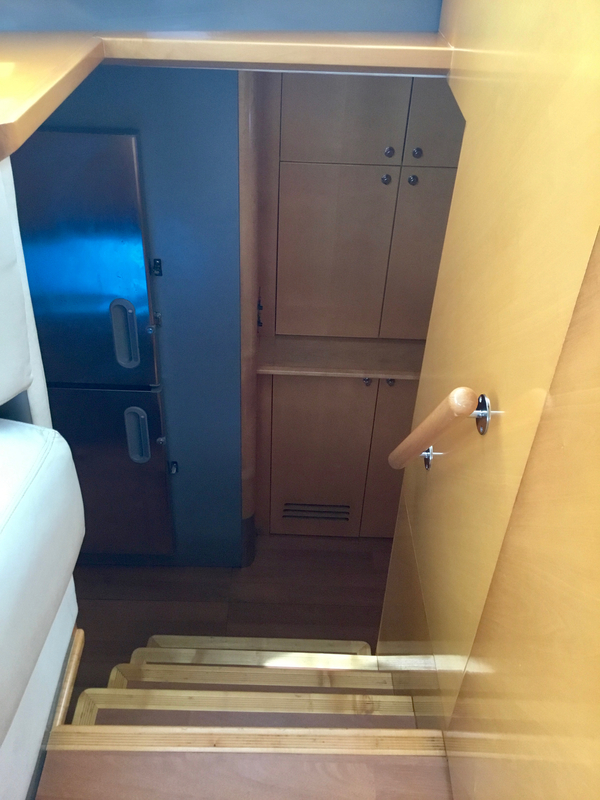 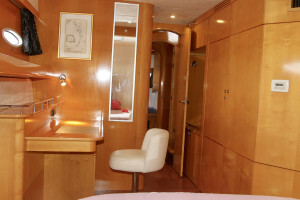 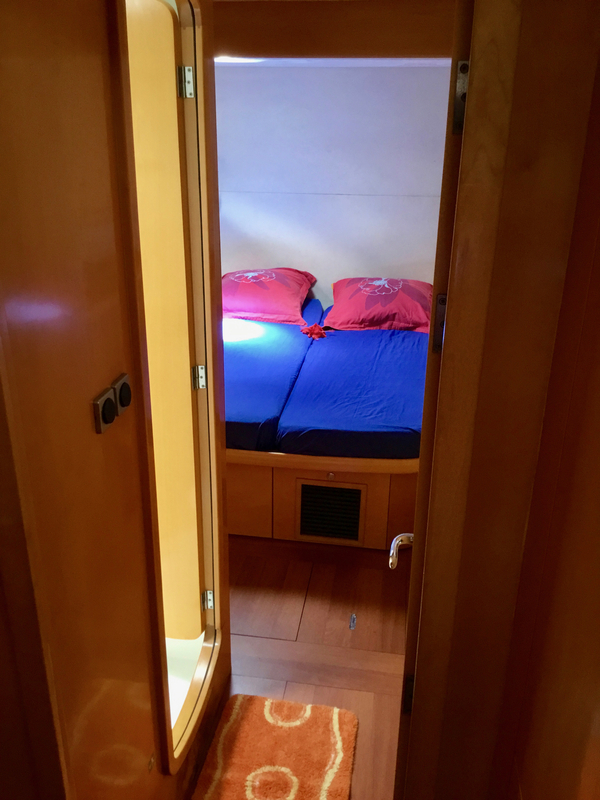 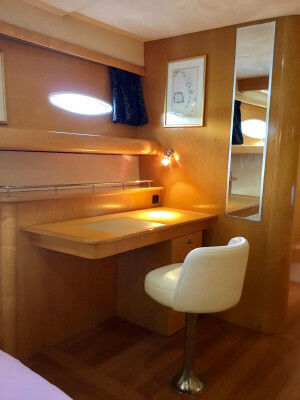 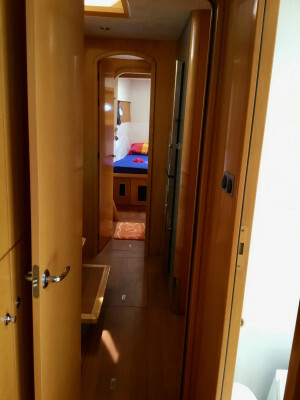 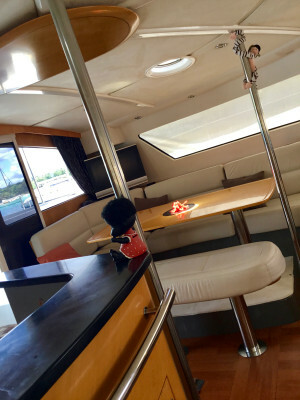 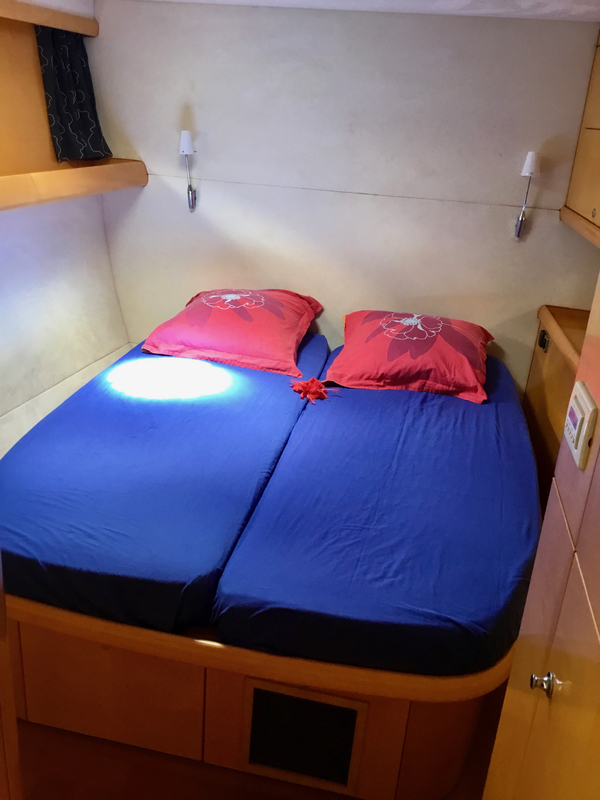 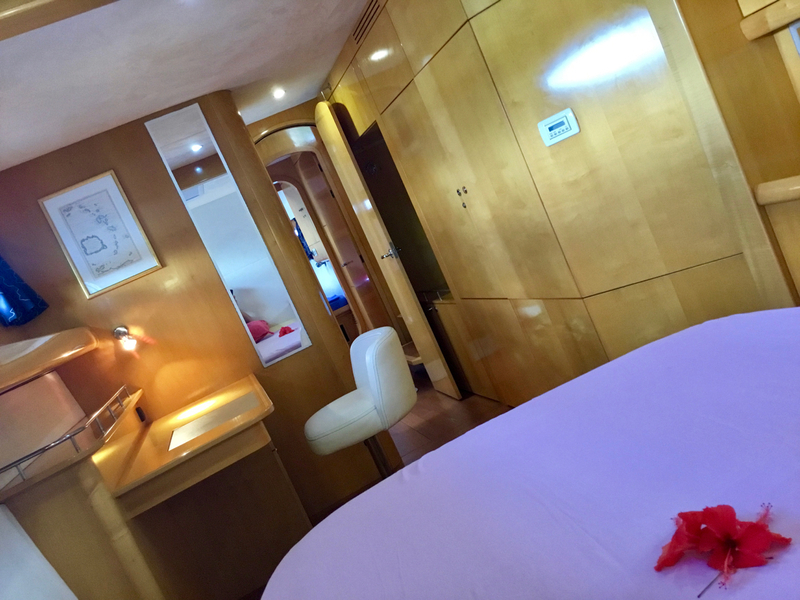 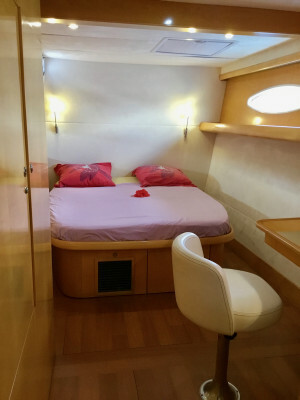 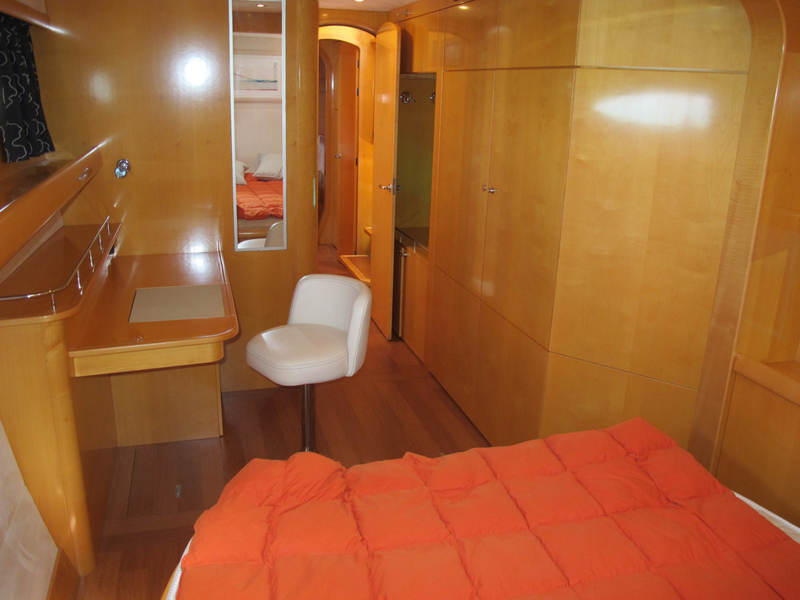 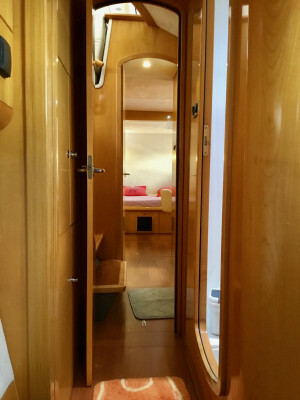 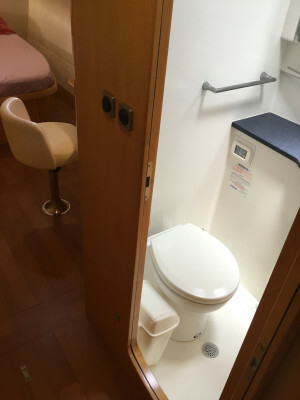 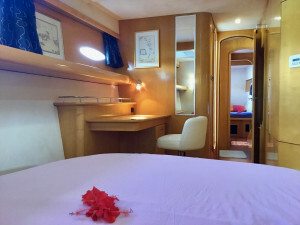 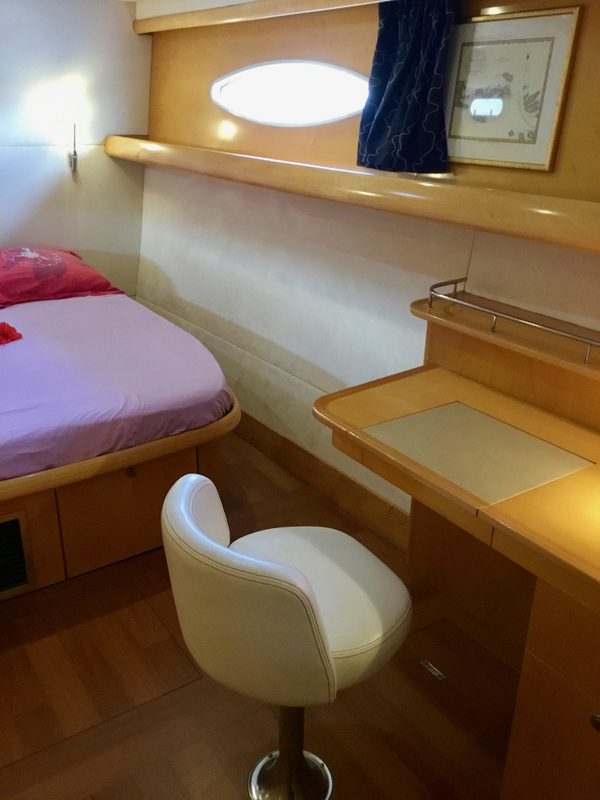 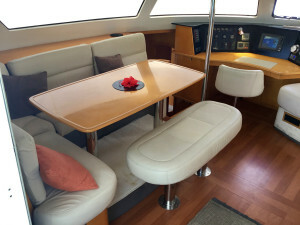 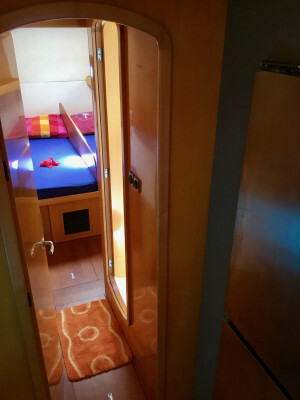 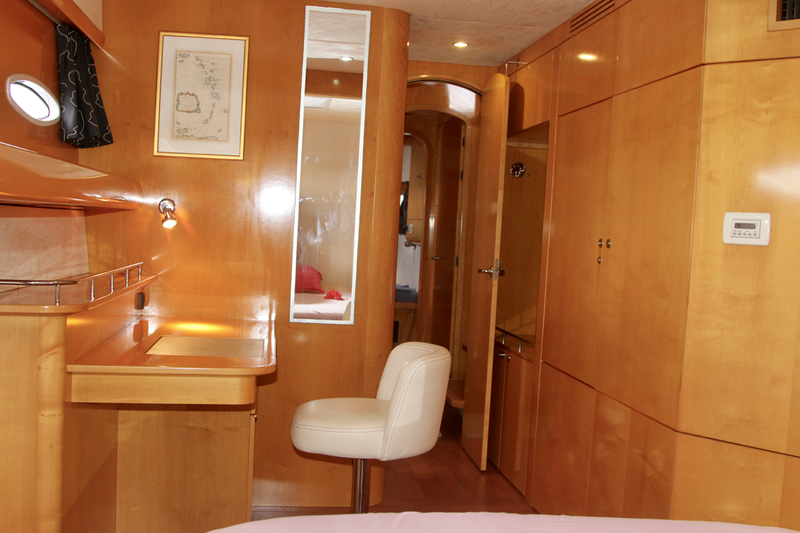 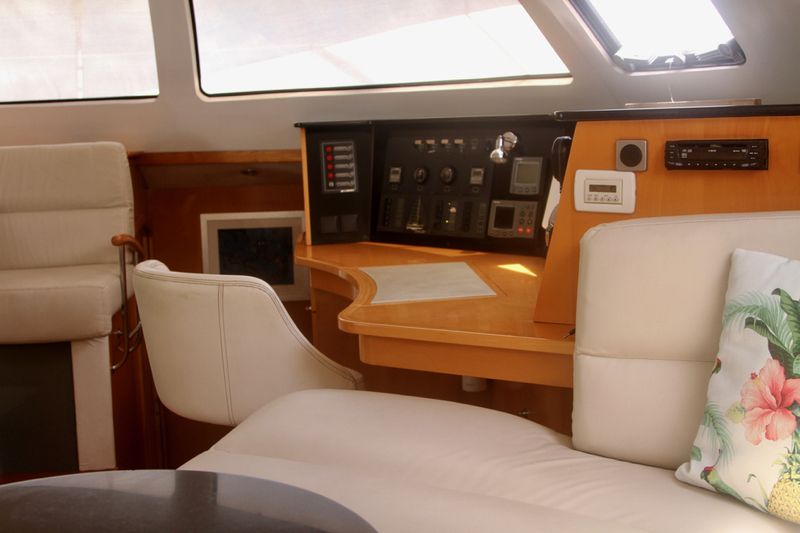 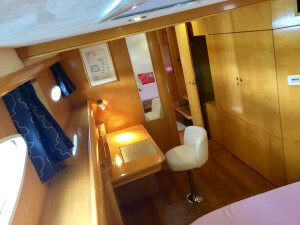 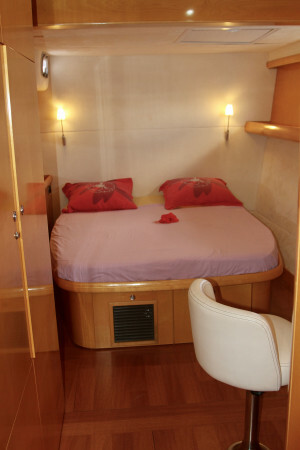 Both aft cabins are equipped with queen size island beds, and all cabins include a remarkable amount of storage, complete with draws and hanging lockers. 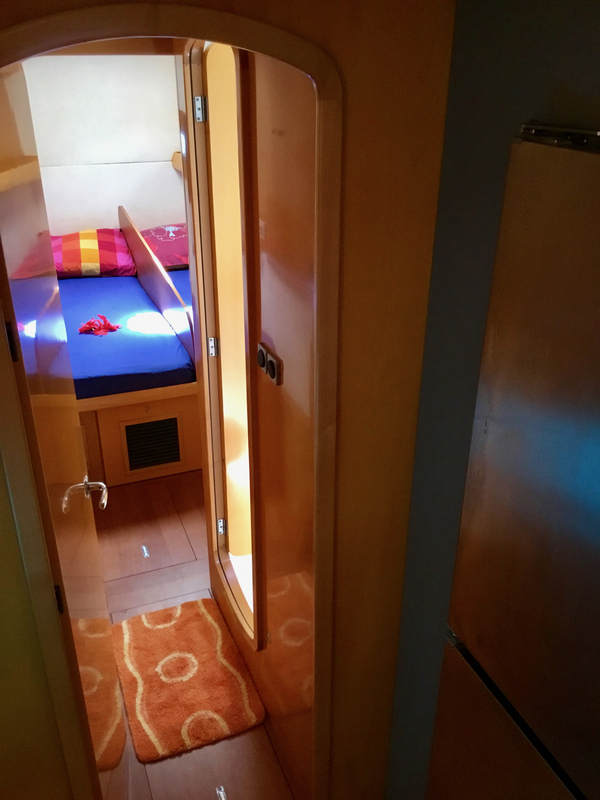 Each cabin has courtesy reading lights, their private air-conditioning control, and plenty of cross ventilation and natural light, that can be easily shielded with tasteful fitted curtains. 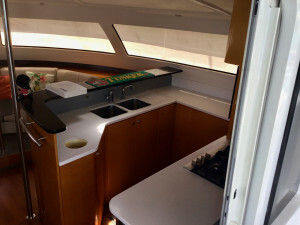 All timber work throughout the boat including floors and traffic areas are in perfect condition. 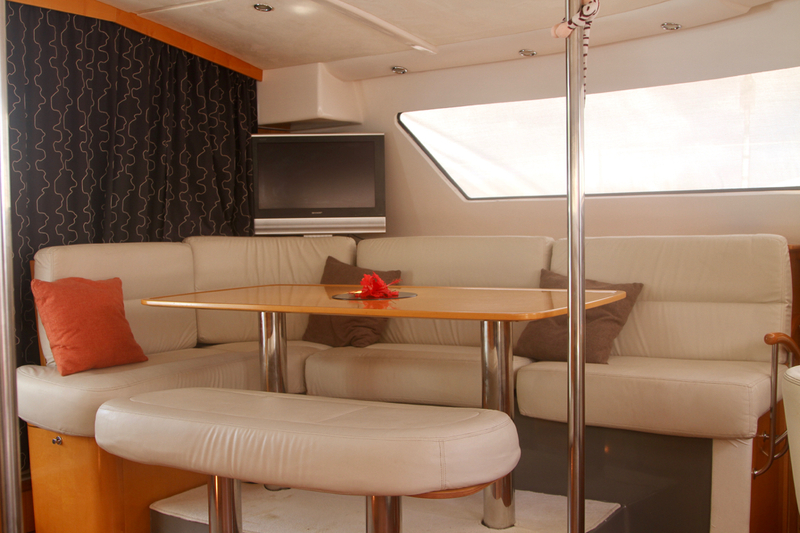 Lastly, the galley is large and suited to someone wishing to employ the services of professional catering. 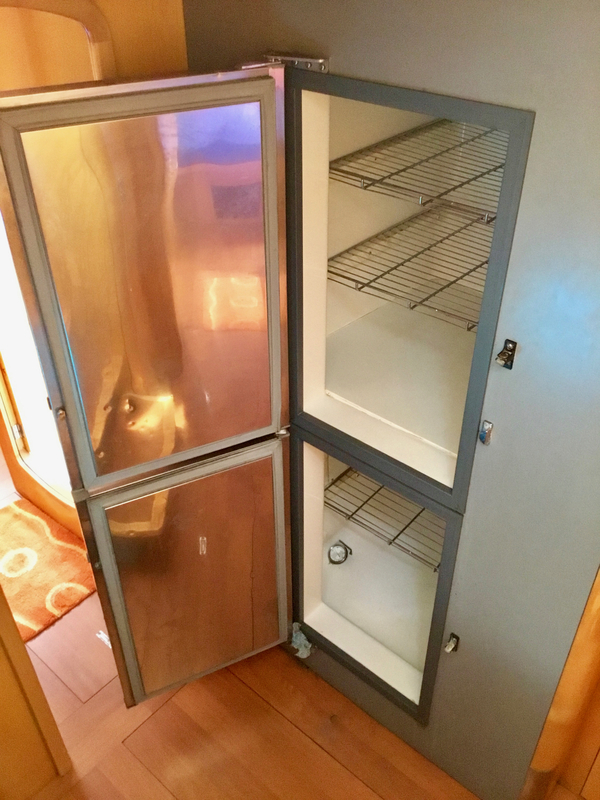 Dedicated food and table-ware storage is abundant, and refrigeration in covered by a 200L stainless steel fridge with separate deep freezer, which is a proper marine design and not a regular domestic product. 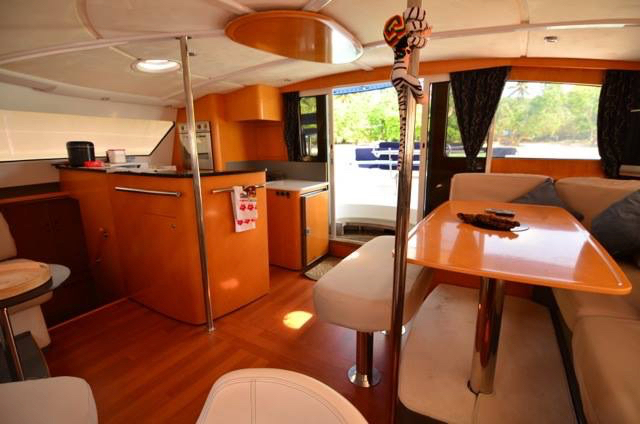 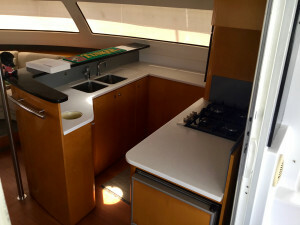 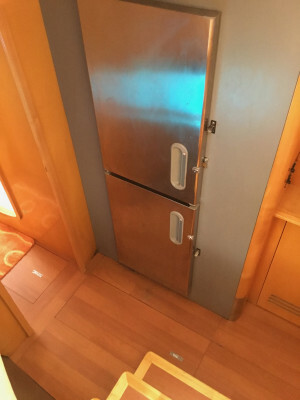 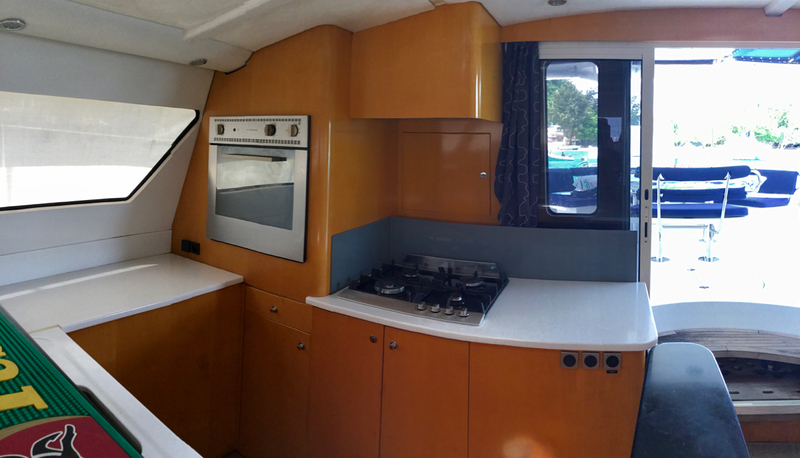 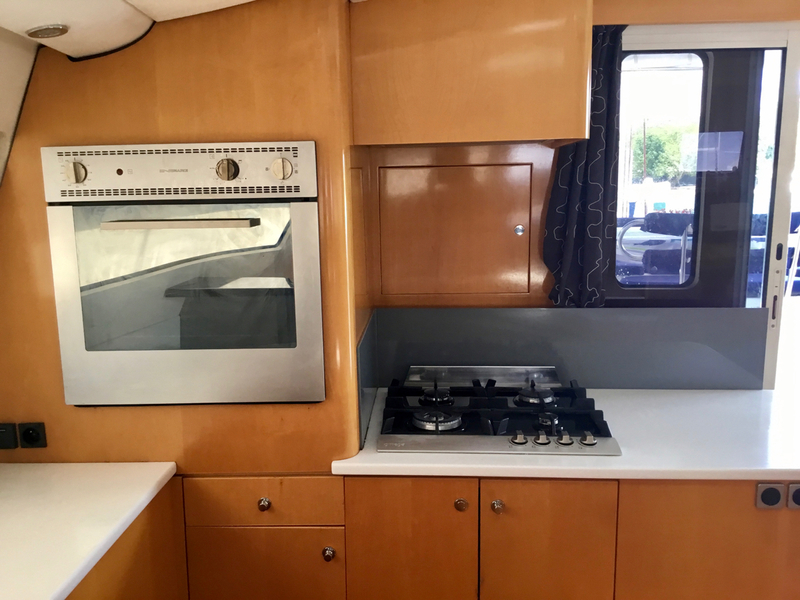 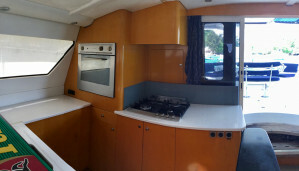 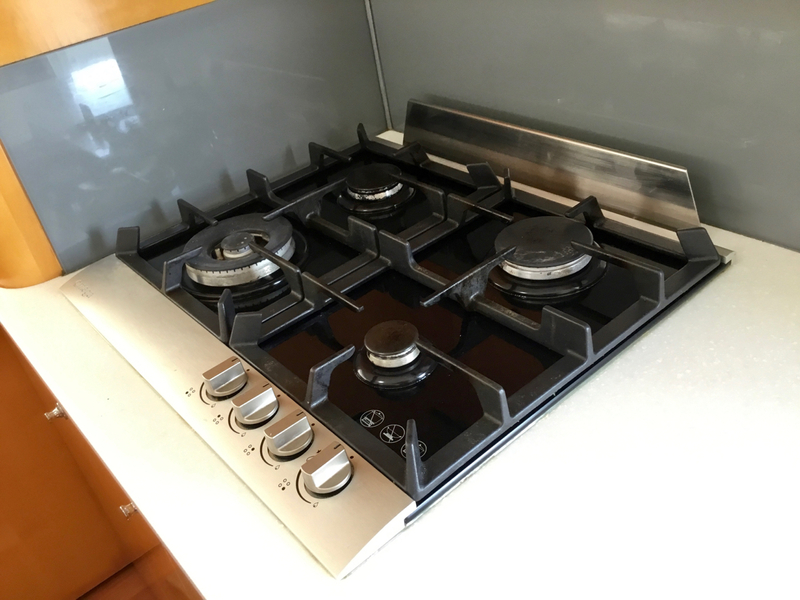 Appliances also include a Line ice-maker, full size stainless steel 4 x burners stove, a full size oven / grill that is fitted separately and well away from refrigeration (where most boats have the fridge right next to the stove..), a double, large sink with drying board and a microwave oven. 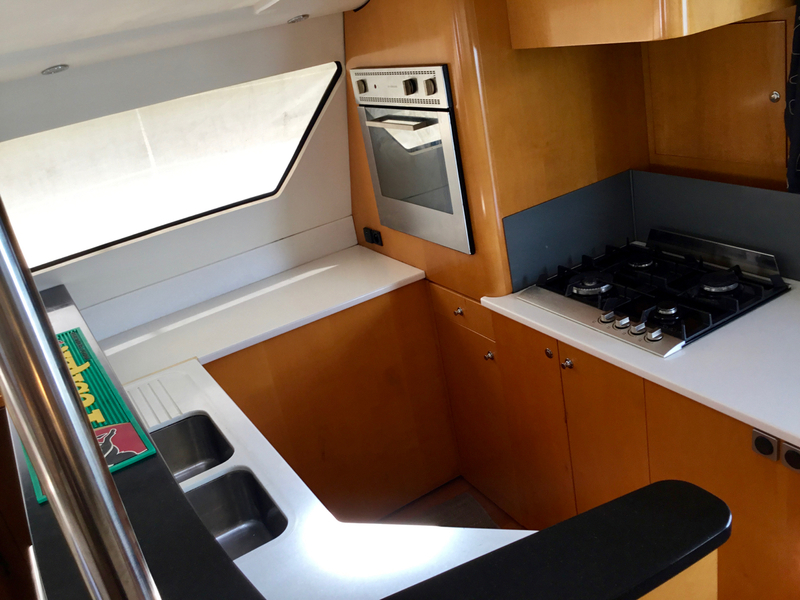 There are several power sockets too to use 220-240V appliances such as toaster, juicer, espresso machines, etc. For more information and to receive a full brochure / inventory please call Nautilus Yacht Management’s dedicated broker Anna Manach Manach or email us at any time. 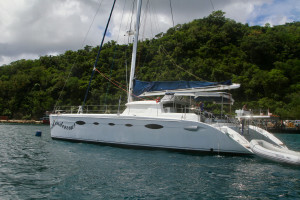 It would be a pleasue to tell you more about this absolutely beautiful yacht and to help you organise a visit.